Ever since George Washington Carver ground up some goober peas into a paste, kids have been nuts for peanut butter. So is it any wonder that peanut butter jacked up with our favorite candy flavors grabbed children by the throat like crack? 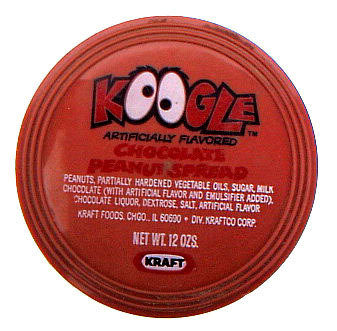 Enter the 1970s’ answer to Red Bull, Koogle, a jar of sweet, sweet deliciousness that led to an entire generation of vibrating children. It didn't matter if we preferred the chocolate, cinnamon, vanilla or banana flavor, we'd slather it between two pieces of bread -- or just grab a spoon and dig in. It's long gone, but there's still plenty of online chatter, mostly from people who were completely addicted to the stuff (me included). Nobody would believe us when we'd talk about it, and they'd look at us like we were the owner of the "Hello, My Baby" frog, who'd only sing and dance when nobody was around. Sure there was something called Koogle. Sure there was. Chew on this, Koogle skeptics! I don't remember that at all! Maybe they didn't sell it here in the south. How could it not have been a huge success? It's a mystery. I have't seen this since I was a kid! Our family was on vacation when we saw this and we all went crazy! It took several more months before it was shown in Baltimore and my life was never the same! Wait. Your LAST NAME is "Koogle?" Seriously?! ?